On June 30, 2017, VA Secretary David Shulkin revealed the Life Under Kinetic Evolution (LUKE) arm while making a visit to the Manhattan campus of the VA New York Harbor Health Care System. The LUKE arm is the most advanced prosthetic in the world and was demonstrated by 2 Veteran amputees who were the first to receive it. Originally designed by Dean Kamen of DEKA Research and Development Corporation, the inventor of the Segway, and dubbed the “LUKE” arm in a nod to the ultra-bionic arm given to Luke Skywalker, this amazing prosthetic is the first of its kind. 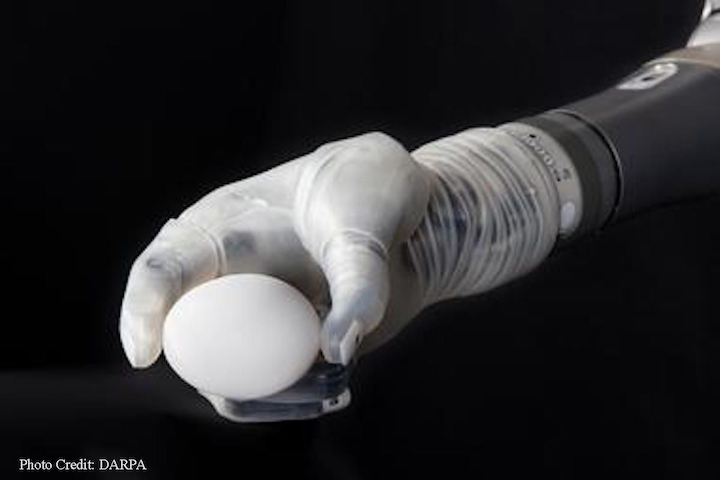 It can perform multiple powered movements simultaneously that make it possible for an amputee to experience “near-natural” control, including the ability to pick up small light objects such as a coin or grape, or even use a hand-held drill. The result of almost 8 years of collaborative research and development between the VA, DEKA, and the Defense Advanced Research Projects Agency, the LUKE arm is designed for a wider range of amputation levels than ever before, including below-elbow, above-elbow, and shoulder-level amputations. It has the first powered shoulder available, which allows amputees to reach behind their backs and over their heads, pour a glass of milk, and even pick up a full bag from the floor and lift it to table top. The LUKE arm can be controlled by a number of sensors. The more traditional electrode sensors and pattern recognition systems are used to translate nerve signals into intended movements. More complex movements are then made possible by using special switches worn on the feet, which send wireless signals to the computer in the arm, giving the wearer the ability to simultaneously move multiple joints. Of 36 participants in a VA-funded study who were fitted with the LUKE arm, 90% were able to perform tasks such as preparing food, combing their hair, and using keys—tasks most prosthetics aren’t capable of. The VA provided health care for 90,000 amputees in 2016. Of those, 20,000 had upper-limb amputations. This is a very exciting time in the field of prosthetics, with numerous advances in technology and robotics. These new advances offer many solutions for amputees and the promise of even more options to come.